Architect John Ronan proposes to transform Chicago's abandoned 2,500,000 square-foot post office into the largest municipal mausoleum on the face of the earth. Is it grand vision or high theater? And is the modern civic psyche too fragile to tolerate such a presence?. John Ronan sees dead people - floating up the Chicago River, driving down the Eisenhower, riding in on the rails - millions of dead people, in fact, all drawn to the old central post office just west of the Loop. Ronan is one of 14 Chicago architects picked by Stanley Tigerman and William Martin to participate in Visionary Chicago Architecture, which the Chicago Central Area Committee set up to generate bold new visions for seven "gateway" sites, including Northerly Island and the Loop el. "We pulled projects out of a hat," says Ronan. "I was one of the last ones to pick, and I was like, 'Oh, God'-because what do you do with that thing? And I knew nobody would want to trade." 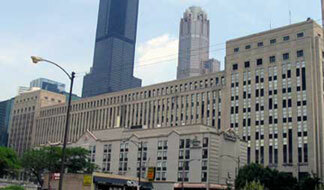 The hulking post office that straddles the Eisenhower opened in 1932 as the world's largest mail-transfer facility. It's been empty since 1996, and every proposal for getting the two-block parcel back on the tax rolls - converting its 2,500,000 square feet to everything from condos to a giant auto showroom to a hotel and office complex - has fallen through. Last June Crain's Chicago Business polled five architects, who came up with more ideas, including a casino. Like all seven gateway sites, the post office was assigned to two architects, one from each of two categories. Tigerman writes in the recently published catalog for the project that Ronan represents a "group less established, somewhat younger (thus, by nature, more spontaneous)." His counterpart, Laurence Booth, is from what Tigerman calls the "more established" group: "somewhat ripened (and by definition, more sophisticated)." All 14 proposals will be on display in Millennium Park in an exhibit that opens on June 13. Booth contends that "expressways don't make livable cities," and his plan would start by demolishing the post office except for the end pavilions along Van Buren and Harrison - substantial buildings in their own right. In between, under a covered plaza, he'd put an "intermodal transit center"-a transfer point for people entering the city via cars, Metra trains, the CTA, boats, bicycles, and Greyhound buses. (relocated from the current Harrison Street station.) The Eisenhower would end three blocks west of the transit center at the spaghetti-bowl interchange, and the roadbeds three blocks west and east of the old post office would be replaced by a public park. To the north and south would be a chain of multistory "live-work" buildings, with parking on the first seven floors, offices on the next three, and apartments on the top six. The plan is forward-looking in that it allows people to live close to where they work and encourages them to use alternatives to the automobile. It also harks back to the 1909 Burnham Plan and the elegant, if somewhat monolithic, neoclassical buildings that lined Congress Parkway as it led to a great new domed city hall on Halsted. Ronan's proposal couldn't be more different - it's is surprisingly protective of the existing structure. "It's a very important building in a way, and it really deserves to have some important use to it," he says. "You can see why it's resisted being converted into offices or housing-it's so deep. The structure is very heavy, so essentially I was saying, well, it's a storage building. What could you store there? And then I came up with the idea of a cemetery-and using the river." 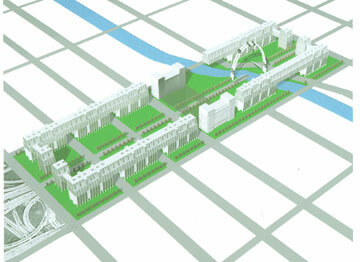 He proposes a "municipal mausoleum," an "urban burial ground." He would build a new structure in the deep recess along the back of the post office and face it with a skin of pre-patinated copper and unglazed "eyebrow" windows angled to keep out rain and snow. Glass from most of the existing windows would be removed, opening the building to the outside air. In the catalog Ronan describes how the dead would be brought into the building, a theatrical vision inspired by Arnold Boecklin's haunting 1880 painting The Isle of the Dead, part of which is superimposed on Ronan's rendering of the mausoleum's east elevation. "A funeral barge floats silently down the Chicago River to the site where the Old Post Office once stood," he writes. "A figure clad in white steps onto the river landing, and leads those gathered at the river's edge up an incline to the foot of the large, rusting steel doors. The figure knocks. A hollow echo precedes the slow opening of the doors to reveal a long hall lined on one side with chapels. The white figure leads the group to the open chapel where the ritual of life and death takes place. The rear wall of the chapel opens wide, leading the funeral party to the crypts above. Upstairs, the funeral procession winds through the glass crypts, past the reliquaries that hold souvenirs of lives now past. The reflection of candle flames flicker in the polished floor, animating the wind that passes through the open facade." Ronan isn't an architectural Tim Burton. He was raised Catholic but says he's now "more of a Buddhist," and his work has included several church concepts. He's serious about his proposal, though the less dramatically inclined could bring their deceased loved ones to the mausoleum on the train or in a traditional hearse. His "rusting steel doors," nearly 30 feet high, would be made of Cor-Ten steel, which can be found on the Daley Center and the Time-Life Building; this steel starts out a bright orange, then oxidizes, creating a deep brown protective coating. 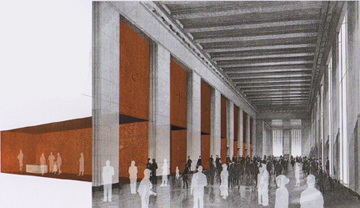 The "long hall" would be the block-long former lobby of the post office, one of the few heated areas in the mausoleum, and the chapels, also faced in Cor-Ten, would open up off the lobby. After a service the dead would be taken from the chapels in the old freight elevators up to the 14 internment floors, where their remains would be stacked six high. In front of each crypt or niche would be a memorial plaque with the name and dates of he deceased, and in front of that a slot for a votive candle and a sealed glass chamber where mementos of the departed could be placed. Seven-foot-wide aisles would separate the stacked coffins and urns, leaving room for 90,000 sets of remains on each floor-a total of more than 1.2 million. interested in mortality statistics and burial statistics," he says. "About 30 to 40 people every month in the city of Chicago go unclaimed." He helped his students at IIT design a cemetery for people who die in a hospital or wind up in a morgue with no friend or family to claim the body. Ronan estimates that the city now devotes about 78 million square feet, or nearly three square miles, to cemeteries, but those cemeteries will become increasingly crowded. Approximately 24,000 people now die in the city each year, a number that's estimated to rise to 36,000 a year in 2060. The cremation rate is going up in Illinois-17 percent of the dead were cremated in 2003, and that figure is expected to rise to nearly 20 percent by 2010-but many people will still want their entire bodies laid to rest. Ronan also thinks some of the already buried could be relocated to the mausoleum to free up space for other uses in the city. Given the uproar over the proposal to move 1,300 bodies from Saint John's cemetery to let O'Hare expand, it's hard to see that happening, but it's been done before. Lincoln Park is built on the site of the former City Cemetery, whose graves the city ordered relocated in 1864. The Couch mausoleum, still standing in macabre isolation behind the Chicago Historical Society, is its only remnant. John Kinzie, Chicago's first permanent white settler, was moved from the Fort Dearborn cemetery to the old City Cemetery to the new City Cemetery before finally ending up in Graceland, at Clark and Irving, which was outside the city limits until 1889. 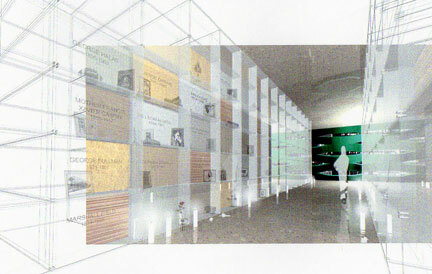 The rendering Ronan made of a typical set of crypts is populated by a who's who of Chicago celebrities - Nelson Algren, George Halas, Marshall Field, Mother Cabrini. Like the Pantheon in Paris, his mausoleum could become the resting place for the city's most illustrious dead. Large numbers of Chicago's mayors already rest in just two cemeteries, Graceland and Rosehill. Maybe the mausoleum would become a great civic memorial if they were all brought together like the popes in Saint Peter's. Maybe it would even become a public attraction, just as in Victorian times cemeteries were places to bike, stroll, or have a picnic. "People went to cemeteries because they predated parks," says Ronan. "That's what led to the parks movement. Once you had parks, people stopped going to the cemeteries, but I think people could come here." Many of the architects who participated in Visionary Chicago Architecture displayed a remarkable lack of curiosity about the worthwhile attributes of their assigned gateway sites and either demolished them or overwhelmed them with out-of-scale new structures. Ronan focused on the value in what was already on his site. He sees demolition not as visionary but as massively expensive and wasteful. "Seventy percent of what's in landfills right now is old buildings," he says. 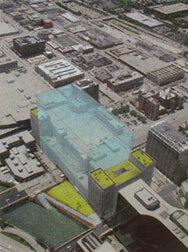 "The silliest thing would be to put a green building in its place-you carted away this three-million-square-foot thing. When I started I said, I can't justify that." 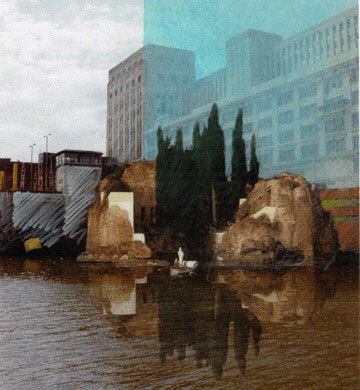 Ronan's proposal confronts a neglected but fundamental issue: how a city deals with its dead. That may not be the first thing that pops into your head when you hear the word visionary, or what most people would want at the center of a great urban gateway. Yet among all the things modern culture is in denial about - racism, sexuality, class warfare, our worship of the market and indifference to its toxic effects, the addiction to sensation and distraction, to name just a few - death may be the only one that is not shameful; only unsettling. No less than for our first ancestor, death remains a primal object of fear, mystery and faith. It refutes the facile perfection of those virtual worlds in which we spend more and more of our time. Each random glimpse of Ronan's great mausoleum would be like hitting the "pause" button on the rondo burlesque of our daily lives as it carries us along on an ever faster stream that somehow keeps delivering us, over and over again, back to exactly the same place. Its presence would be an invitation to disenthrall ourselves from unquestioning habit, and put our lives back into perspective. A naive notion, perhaps even a foolish one, but ultimately, one of community and hope. Isn't that what vision is all about? All 14 entries to Visionary Chicago Architecture will make up a free exhibit on display at Millennium Park on the rooftop terrace of the Harris Theater for Music and Dance, 205 E. Randolph, 10 A.M. to 6 P.M., Mondays through Friday only, from June 13th through July 15th. Also closed on Tuesday, June 21st and Wednesday, June 22nd. © Copyright 2005-2006 Lynn Becker All rights reserved.